What do you do with all the stuff you find? I am constantly pipping images out of magazines, clipping how-to articles, keeping postcards I get in the mail, and experimenting with different art techniques. I put all these clippings and objects in a place where I see them every day - my Inspiration Wall. The "wall" is a piece of cork board painted white that I have installed in my home office. I currently have pinned up some of my own art experiments, a piece that was made by Dawn Wilson of Creatively Anew, photos I bought at a flea market, a how-to for making a photo album of photos with a glued spine, and a random assortment of other inspirational tidbits from magazines such as Art In America, Martha Stewart, Real Simple, Art New England, and the Globe Sunday magazine. 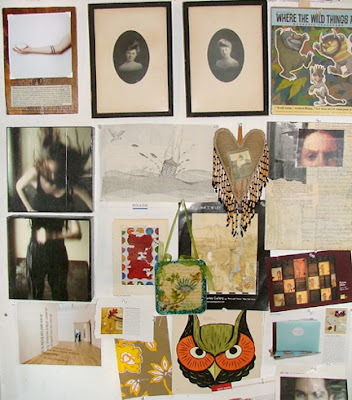 What's on YOUR inspiration wall?